This new STCW Master (Workboats) <500gt CoC was announced by the MCA at Seawork Exhibition 2013, after over 5 years of consultation with JPMA and the National Workboat Association. Full details are included in MGN 496 which was published on 27th June 2013. In all cases candidates are advised to undertake the courses in stages, i.e. OOW courses complete before moving onto Master level courses. Training module passes are valid for three years except for the workboat module, which is five years. The training module pass certificate must be in date at the time of issue of the CoC. 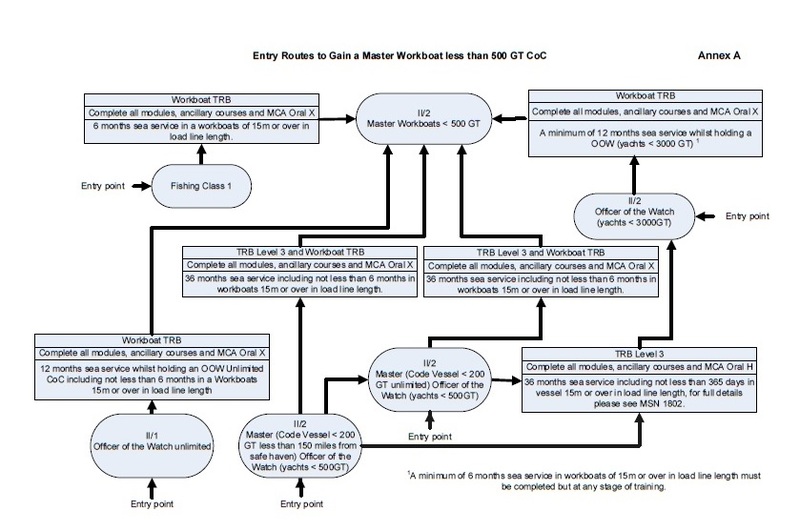 As there are a large number of modules to undertake you are advised to obtain the MCA OOW (yachts <3000 GT) CoC where circumstances may preclude you from completing within the three year validity of the training modules. The OOW (yachts <3000 GT) modules are not then required to be presented for the Master (Workboat <500 GT) within the three year validity. You will be required to meet any sea time requirements regardless of the route you take. ‘Not for use on ECDIS equipped ships after 31 December 2016’. Certificate of successful completion of ‘Business and Law (Master Yachts)’ training module and examination. a) You must have completed 6 months sea service on a workboat of 15m or over in load line length. b) Complete 6 months sea service in a workboat 15m or over in load line length including not less than 120 days watchkeeping service in vessels of 15m or over in load line length. JPMA offer most of the courses needed for this CoC, highlighted in blue on this page. We also offer oral preparation for the MCA Oral Examination, further info on this can be found here. Click here for course dates or email mate@hss.ac.uk for further information.